Today, I want to share a post originally published on themindflayer.com and written by my son, Joseph Sale. In this article, Joseph goes some way to defining the epic, what it is, where it came from, and the difficulties of writing one in the modern day. The English Cantos is undoubtedly my attempt at writing an epic, and so I thought it appropriate to share as many of the points raised here resonated with me. It may even help you pen your own epic! In this series, I’ll be discussing what defines an epic, how they’re changing in the modern world, and I’ll explore ways in which you can shape your own epic narrative. My aim with this series is to inspire people to engage with more epics, to widen the discussion of epics to include other mediums such as video-games and serializations, and to lastly, perhaps most importantly, aid people wanting to write one themselves. So, let us begin. Throughout time and culture, one artistic pursuit has, by and large, been held in regard above all others. This is the creation of an ‘epic’. Narrative is central to human ideology, identity, and our relationship with the world around us, it helps us make sense of things, processing both our external and internal worlds. At its deepest level, it is healing. The act of writing is therapy, catharsis, liberation. And core to the literary heart of so many cultures, peoples, tribes, religions and countries throughout the ages is the concept of an epic. A story that is greater than other stories. A story that operates on an entirely other scale. These are some of the most powerful and healing stories of all time. To write one is one of the highest forms of artistic achievement. But rarely is one written purely for praise and honour and bragging rights. They are written from a deep place. They can only be written from that deep place, which is why so many of them begin with an invocation to gods, or the Muses, or even human sources of inspiration. To write an epic is to shake the soul of a person. Now, I can’t teach you how to write an epic. I’m not sure that’s even possible. I maintain I can teach anyone to write and that everyone has one story in them, but I’m not sure I believe everyone has an epic in them. An epic is a one in a million. An epic is lightning bottled. However, having studied epics for a long time, I think I can give you some steering on what they involve, how they work, and give you examples of recent modern and accessible works that use epic tropes. These will act like Muses in themselves, guiding your path. From there on, it’s all you. But if you really feel you have an epic in you and you’re reading this, I’m telling you: You have to write it. We need epics, like we need food, water, air. Yes, that’s not melodrama. Without them, we wither. Culture withers, human relationships wither, our sense of who we are and what life means withers. Stephen King said that art is a support system for life. Never were truer words spoken. Science helps us to live. Art gives us a reason to. So, let’s start with an overview and go from there. Are you excited? I’m excited. I hope you have a pen and notepad ready. Traditionally, the epic is relayed in poetic form. Some were performed by the poet, or upon a theatrical stage. Some were set down. Either way, the epics of the past are unified in poetry, although the poetic form they might be expressed in differs drastically. In recent years, it seems there has been a tailing off of epic poems, although they are certainly still being written in our time. One such example being my own father’s astoundingwork The English Cantos: a modern journey into hell recounting his experience in Bournemouth Hospital battling cancer. It is penned in fluid terza rima, homaging Dante’s Divine Comedy. The first three Cantos of this amazing poem have been published by the Society of Classical Poets, and are available to read for free. He continues to write it, aiming to publish 33 cantos in total. This work in progress is what I would call a poem penned in the ‘true epic style’. It tackles the issues of modernism, the disintegration of moral values and the meaninglessness of a modern world driven by profit and gratification. It uses many of the epic tropes: the invocation of the muse (calling on Calliope, the Muse of epic poetry specifically), the wise guide (in my father’s case, Dante himself, the poet who perhaps best explored hell before him), and the katabasis, the descent into hell itself. My father is not the only one to attempt an epic poem. In the last decade, many ‘new’ epic attempts have emerged, including Tim Miller’s To the House of the Sun and Apocalypse by Frederick Turner. But, it’s safe to say that these are obscure works, not popularly known as the epics of Homer, Dante, and Milton would have been in their day, confined to study by poetry-nerds (such as my father and I) concerned with this ‘niche’. In fairness, my father’s epic is being fairly widely read, partly due to its accessibility in terms of theme (we all feel the dearth of this era), style (it is beautifully written in form that propels the narrative on, as opposed to many other modern poems written in formless free-verse), and its publication online which allows anyone to read it. However, poetry in general is not the pick of the day. How many people can truly say they regularly read poetry? It has become a niche of a niche, a subset of writing itself, whereas once it was the entire aim of it. The long and short is, unless you are a poet of considerable experience reading this, I think it’s highly unlike you’d want to attempt an epic poem. I’m not saying you shouldn’t, of course. If you’re that way inclined, go for it. Poetry will never die. There will always be poets, and poetry, and it will always have validity. You see, epics are a bridge between past and present. Often, they refer back to a past time, but use modern language to describe it. Similarly, most epics are written when the language is young or even unformed. To get specific, it’s thought that when Homer penned The Iliad, the first of his two major known works, around 750 BC, that the Greek language had not formally been set down prior to his writing of that book. In a way, writing The Iliad, was a way to document the rules, vocabulary and possibility of the language. In short, The Iliad may have served a dual function as an extremely beautiful grammar book. It covered the full spectrum of linguistic potential, and concretised much of the spelling and punctuation. Similarly, Geoffrey Chaucer wrote The Canterbury Tales after the invasion of the Normans and the influx of French words into the language which broadened the ‘primitive’ vernacular tongue of Anglo Saxon into what scholars refer to as ‘Middle English’. Before then, the language was limited to predominantly Germanic-influenced words. Chaucer introduced Latinate and French words (and some others too) in penning his epic, vastly increasingly the potential of the language. Whilst Anglo Saxon had been around for a while, it went through an evolution when he wrote The Canterbury Tales. ‘What in me is dark / Illumin, what is low raise and support; / That to the highth of this great Argument / I may assert Eternal Providence, /And justifie the wayes of God to men. Just pick out the words: ‘argument’, ‘assert’, ‘justify’ – the language of a legal associate going through her case opening. But this, married and juxtaposed with the stunning, heart-breaking imagery, and the depth of incredible feeling, is what makes Paradise Lost work. So, you see, when the language evolves, it often provides new, fertile ground for writers to pen an epic. Once the ground has been well-trodden, it’s very difficult indeed to write one. And whilst our modern language is certainly changing and evolving, I’m not sure it’s changing in such a way that facilitates the writing of an epic. Normally, it is when a language expands that new possibilities for another level of storytelling emerge. However, I’d argue that many changes to our language now are merely to increase its basic functionality and efficiency. Text-speak, abbreviations, emojis. There’s nothing wrong with these (and many epics contain phrases and conflations which would have been known to people of the time), but too many of them makes writing at a feeling level difficult, because they are ultimately mechanical, designed to conserve space and time. But does this mean the epic is dead? No, I believe it is far from it. Over the course of this series, I want to talk about what a modern epic looks like, specifically focusing in depth on three ‘epics in spirit’ that take on the tropes of the epic but express them in modern forms. These are perhaps genres or mediums you would not immediately think of when considering the ‘epic’. I hope analysing them will inspire and steer you on your course to attempting your own. There is a certain mythos, a Holy Grail allure to writing an epic, that is tantalising to almost all writers. So why not? After all, the Grail Quest is as much about the journey as the end result. Attempting it is, itself, an achievement. What the hell have we got to lose? To conclude part 1, I’m going to run you through what I deem to be the six key tropes of the epic. There are many more than six tropes, of course. Some of the ones I will not be covering today include the ‘extended argument’ (characters, or even one character internally, debating an important or weighty theme in great detail), nationalism (many epics purport to detail the genesis of a people, even Tolkien’s Lord of the Rings) or macrologia (playing with scale and size). Sadly, we do not have time to cover everything, and I’ve chosen to focus on the six ones I believe are most important to defining what an epic is and more importantly how it feels. Part of the epic is this idea of scope. Vast, complex stories with huge casts of characters. 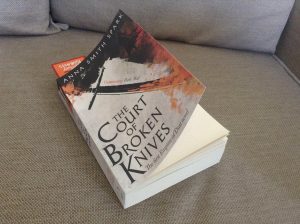 Novels, needless to say, facilitate this rather well, as they are not restricted by factors such as audience attention-span or memory (readers can put down the book and then pick it up again – they don’t have to sit through a four-hour movie). Many obvious examples of epic novels spring to mind (I’m sure you have some too). For me, Stephen King’s The Stand has to be one, with its length, breadth of characters, and theme (subject) – the timeless battle of good and evil. Another, I would argue, is Tolkien’s The Lord of the Rings. In fact, Tolkien intentionally set out to write the ‘unwritten epic’ of the modern English language. After all, the English people had adopted the Greek and Italian epics (with Homer, Virgil & Dante), or alternatively Christian frameworks (Milton & Spenser). Tolkien wanted to create something that uniquely belonged to us, and I think it’s fairly safe to say he achieved it. 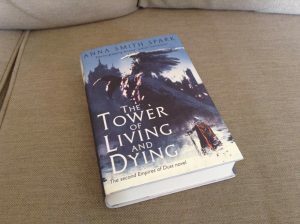 In terms of recent entries, I recommend you check out Anna Smith Spark’s incredible Empires of Dust series, which is written in a fresh yet epic style that has a flavour of The Iliad’s blood-drenched intensity. Scope and subject matter go hand in hand. Milton spent a long time thinking about what the subject of his epic would be, because he knew it would determine all the possibilities of his story. One theme he contemplated writing about was the Arthurian myths, though this had already been partly done by Edmund Spenser and Chaucer, the former of which was one of his inspirations. Eventually, Milton settled on the Christian Fall of Mankind. It should be noted that epic subjects do not always have to be original. Milton’s poem drew heavily from, of course, the Bible, but also from Anglo Saxon/Old English poetry that re-told the story of Adam and Eve to align the Christian stories with Pagan values (Genesis A & B). The Anglo Saxon poems of Genesis A & B make Eve into a complex character, seduced by knowledge, tricked by Lucifer’s superior powers, and ultimately sympathetic, as opposed to many earlier Christian narratives that blamed her for mankind’s misstep. Milton hugely incorporated this in his own re-telling. Shakespeare drew most of his stories from Roman or Greek plays, or history, and reworked the narratives to suit his ends. The long and short is that with the epic, it is as much the telling of the tale as anything else. But, you need a tale that is going to provide you with enough scope to reach epic heights. Epics have a certain style about them. It is often called the ‘elevated’ style. It conveys grandeur and scale and significance. Pulling this off without sounding pompous is very difficult and something every epic writer has struggled with for millennia. Epics are often told out of order, with a device called in media res, a Latin phrase meaning quite literally:‘in the middle of the thing’. The stories start mid-action and work backwards and then forwards, allowing for incredible resonances and webworks of emotional complexity to be developed in a way that is more sophisticated than standard narratives. Another part of epic style is what is called ‘epic catalog’, what I affectionately term the ‘roll call’, the listings of endless ranks, positions, people, places, events, times, dates, and items. Epics have scope, remember, and they can increase their scope by listing minutiae to give the reader a sense that this is a detailed and real world. In The Iliad, we don’t just know who the main actors are, we also know who practically every damn soldier in the Greek armada is. Many fantasy novels use this trope poorly, resulting in podgy prose that is laborious to wade through. When done well, it creates a sense of excitement and scale and three-dimensionality. Finally, a key part of this style is the ‘extended metaphor’. Elaborate metaphors and similes, as well as comparisons, that are more developed and in-depth than standard imagery. Epics are beautiful, and should evoke beauty even in their most horrifying moments. Part of the way they can do this is with extended metaphor and beautiful imagery. They elevate an image to something else entirely. Epics must invoke the Muse, because they are not simply stories written from the brains of writers, but divinely inspired. Epics often open, or at some point feature, a calling upon a divine entity to aid in the recital of the poem. The hero is often guided by either another hero that has gone before them or a sage guide or counsellor. Odysseus, in Homer’s The Odyssey, is guided by the goddess of wisdom Athena. Dante is guided by Virgil in hell (and in turn my father is guided by Dante in his version of hell)! Adam is (mis)guided by Satan in Paradise Lost. Satan himself is guided by Chaos. The list goes on and on. All heroes must descend into hell. Hence, the title of this series: Entering Carcosa. This is arguably the most important aspect of the epic, in my humble view. The hero proves himself/herself above all normal heroes or normal stories by surviving hell itself, whether literally or figuratively, is up to the writer to decide. So, these are the six key tropes of epic literature. You have now had a potted history of predominantly Western poetic literature (as much as I would love to discuss the Sumerian epic of Gilgamesh, or the Chinese epic The Romance of the Three Kingdoms, there is simply not time – nor am I sufficiently qualified to speak on these). This should, however, give us a background to launch into discussing our first ‘modern epic’ next week, which in fact hails from Japan. Until then, adieu! If you are interested, you can find part 2 of Entering Carcosa here. When I first went into hospital I was in for six days. For the first four of those I didn’t eat, and for the first five I couldn’t sleep. Then, on the fifth night, exhausted, I fell into a profound sleep, and received a vision – I believe from God – about my illness, showing its causes and what was about to confront me. In the final part of this vision, an ugly midget, dressed in a black suit, informed me that he wanted to ‘acquire my power of flying’, and as I tried to escape him by flying through an open window, I found myself caught by the leg and unable, physically, to free myself from his grasp. Further, as I tried one last feint to free myself, it was as if the window pane itself shut down on me, and I woke with a start – a pain across my midriff, as if I had been divided in two. This proved very prophetic, for following 2 major operations, the final problem I was struggling to resolve was getting my stomach to work in conjunction with my small intestines – there seems to be a rift, a divide between them, exactly as in the vision. As a great believer in the power of our self-beliefs and the images and stories we create for ourselves, I spent time in the hospital trying to re-engineer the vision – re-visualize it with a different ending. I was, in a way, trying to will myself better. I imagined new endings, but for all that, none of the images had the vivacity and intensity of the original dream, so it didn’t work. The great fear became not that I would die, though I was terrified of that, but that this illness would cause me to lose ‘my powers of flying’! When I heard the midget say that in the vision, I instinctively understood that this was a metaphor for my creativity and the very poetry of my soul. Poetry allowed me to fly. I had been waiting and praying, therefore, for a healing dream to counteract the power of the original nightmare. One day, I got up and went to the hospital chapel. Alone there, I prayed and meditated deeply for a short while. When I got back to my bed, I suddenly had an idea. I grabbed my notebook and in a wonderful moment of no more than 25 minutes in total I downloaded a poem called ‘Healing Dreams’. I didn’t ‘work’ at the poem, I hardly had to correct it; I simply had to be inspired. It didn’t require sociological or political knowledge – it just required that I be open to the One Spirit that moves everything. And as I wrote the final line – a line I didn’t really write – I cried. For the poem was as good technically and artistically as anything I had ever written. I realized that post the operations, post the attack of the small dark figure in my dream, I could still fly – and, therefore, I was already whole and healing. I would like to share with you this poem, which has meant so much to me, and was and still is a breakthrough. I believe in my healing because it has come from the Spirit. And feeling I am whole. When I was a child I was fascinated by myths, and especially those concerning the underworld, what we sometimes call journeys into hell. It is difficult to account for why these sort of stories appealed to me, although now – at the later end of my life – it’s all very clear. Having been to hell – my 3 months hospitalization and battle with cancer, the source of inspiration for The English Cantos themselves – then obviously my fascination was a sort of premonition of my own descent. 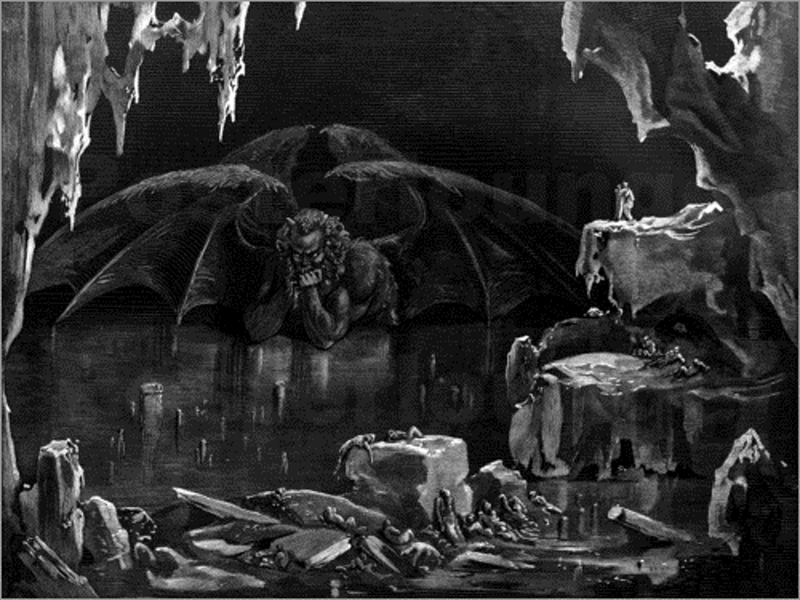 All cultures have stories of heroes who descend into hell; it seems to be one of the most universal stories. I am fascinated by all of these versions, but some of the most intriguing to me are the myths of the Ancient Greeks, not in the least for the psychological realities they reveal. Many of their heroes stormed hell – Heracles, Theseus, Odysseus to mention only three, three who returned. Of course, some – like Pirithous – failed to make it back. But of all the heroes who explored hell, the greatest – the one who descended furthest – was ironically not a great warrior at all: the poet and musician Orpheus went deeper into the Underworld than even Heracles, and did it through his music and poetry alone. What is the significance, then, of the Orpheus and Eurydice myth? First, the desire to enter hell arose not from a compulsion for heroics but because his beloved wife, Eurydice, had died as a result of a snake bite. Thus Orpheus resolved to enter hell in order to bring his wife back to life. In facing all the dangers and perils of hell, Orpheus’ solution was the same: to play his music and sing his song. So Charon, the ferryman, rowed him across the Styx without the obligatory payment; so Cerberus, the three headed dog that was virtually impossible to subdue, except by Heracles, was charmed into sleeping by the music; so all perils and obstacles yielded to the music. Till at last, Orpheus stood in the very throne room of Hades, lord of death and hell, himself. There, before Hades and his queen, Persephone, Orpheus reached the climax of his song and struck the notes. It is said for the first and only time Hades wept – tears of molten tar. But more remarkable still, being in the throne room itself meant that the sound within its box vibrated throughout the whole domain of hell itself. All in hell heard the song of Orpheus. Thus it was that the damned, Ixion at his wheel, Tantalus striving for his water, and Sisyphus fruitlessly and endlessly pushing his boulder up the hill only to find it roll back down each time, suddenly froze. They heard the music and their pain lifted. Their dull animal instincts to repeat and repeat their pointless activities – like rats in a maze – gave way to the return of human cognition. For a moment they experienced relief and were enthralled by beauty – the beauty of Orpheus’ singing. And then it ended – and the damned returned to their endless damnation. Hades was grateful for the entertainment and said he would grant whatever Orpheus wished for; Orpheus requested the return of the life of Eurydice. This was granted but with one tiny condition: that she follow him some twenty paces behind and that he must not turn to look at her before reaching sunlight again. Orpheus eagerly agreed. So Orpheus retraced his happy steps, knowing Eurydice was right behind him, following him back to life. But then tragedy struck – within sight of daylight at the end of the tunnel leading up to the world, Orpheus needed to check she was still there. He turned, looked, and even as he did so her form, which had gained substantiality on the way up, now began to de-compose; she waved one last despairing wave, and was gone, forever. His journey had achieved nothing, and he returned alone to the world of sunshine above ground. But had he achieved nothing? It seems to me two important lessons emerge from the tale. The first is by asking the question, why did he fail? The answer is clear: he failed because of his unbelief – his lack of faith – he did not take the god at his word. The god, who was delighted with the song and the singer, had no reason to lie, and yet Orpheus in turning refused to believe him. And this is our problem: we do not believe the god who speaks within us – what Jung called the Self – the deeper part of us that incorporates the unconscious and the archetypes. We rationalise and we think our egos know all the truth – and then as we disbelieve the god we are struck down with our own specific tragedies. The second lesson, however, is far more optimistic. It is to contemplate how hell itself began to turn into heaven as the song was sung; and that reminds us that the universe – the uni (one) – verse (song or poem) is precisely that. All life, all joy is in the music, the pattern, the structure that underpins all that is. And so, even hell is transformed if we can sing our own song. Are you Orpheus? Are you singing your song – being your own poem? Or are you someone who will die with their music still unsung and inside them? The message is clear: get singing – who knows – you may well rescue your own Eurydice from the depths. James Sale will be appearing at the Society of Classical Poets’ “Poetry & Culture Symposium” on the 17th June 2019 in New York. For more information about this or to purchase a ticket, please visit eventbrite.